Whales! The biggest thrill of boating is the amazing wildlife we encounter in and around the Strait of Georgia. Wildlife and their habitat are sensitive to disturbance from people, boats, and pets. 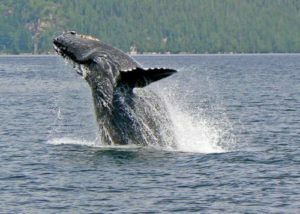 Approaching whales too fast, getting too close, and excessive noise can cause stress and interrupt feeding, mating, socializing, resting, and calf nurturing behaviour. Birds often abandon their nests and young, and feeding or other behaviour critical to survival can be disrupted. Sensitive habit such as estuaries, enclosed bays and narrow channels, eelgrass and kelp beds, and shellfish areas, can be damaged or destroyed. Boaters can also cause the spread of aquatic invasive species which can disrupt the existing balance of ecosystems and out-compete native species. Luckily, there are many ways to minimize our disruption while boating. Our Guide to Green Boating is full of useful tips to ensure we can all enjoy our cruising waters for years to come. Stay at least 100 metres from whales, porpoises and other marine mammals, and 200 metres from seal or sea lion haul outs. If you’re lucky enough to get to travel with whales, always go parallel with their direction (don’t cut across or stop in their path). Avoid erratic manoeuvres, and never chase whales or other animals. Minimize your wake and engine noise. Report observed violations or harassment of marine mammals to Fisheries and Oceans Canada at 1.800.465.4336. Download the Marine Wildlife Guidelines for Boaters, Paddlers and Viewers (Be Whale Wise brochure or Be Whale Wise poster). Stay at least 100 metres from bird colonies. Don’t allow pets ashore where they can disturb birds or nests, which can easily kill young birds. Marine birds often nest on the ground or in burrows on small islets, cliffs and shorelines. These nest are difficult to see, so be careful. Learn more about protecting migratory birds with Canadian Wildlife Services. Avoid running motors in shallow waters, and anchor in a depth of at least 10 metres. Minimize wake in or near sensitive habitat. Avoid anchoring in shellfish, kelp and eelgrass beds, or use fixed moorings where possible. Take care to avoid damaging sensitive habitat with dinghies, kayaks, or during other activities. While it is impossible to keep all pollution out of the water, it is especially important to avoid any releases of waste, oil, sewage, soap or other toxic products around sensitive habitats. Transport of invasive species is illegal in BC. Boaters can spread aquatic invasive species on our hulls, in our bilge, and on our boat trailers. It is important to clean, drain and dry our boats, trailers and equipment when relocating. Boat U.S. Foundation has some excellent pointers on preventing the spread of aquatic invasive species. Learn more about invasive species and the BC Inter-Ministry Invasive Species Working Group. Learn more about aquatic invasive species and Canada’s proposed Aquatic Invasive Species Regulations expected to take effect in 2015. Follow BC Parks Marine Ethics, which covers sensitive habitat, boater pollution, and low impact kayak and canoe touring practices.